In today’s heterogeneous world of art, there are, generally speaking, two fundamental vehicles for connecting with a work: the emotional and the conceptual. The two create structures of meaning and the basis for fundamental interpretation. As the viewer comes to understand a work, an emotional response is as much a facilitator as the conceptual. Slusser Gallery’s current exhibit, Emotion and Abstraction, relies strongly on this emotional connection, whether with abstract or figurative works. Gallery director Mark Slusser provides some insight: “Baxter refers to Randall’s good friend and fellow Utah artist Ken Baxter.” It is a place Lake is free to enter and leave, it evokes the essence of friendship: trust, loyalty, love. 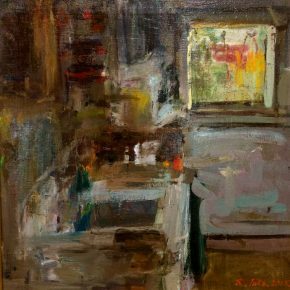 For the viewer to see Baxter’s inner sanctum in this painterly way is on a very physical level of form and aesthetics, distanced. But to realize the relationship between Baxter and Lake, to be able to feel just some of the connectivity of their emotive human vocabulary, makes the painting something different entirely, and this emotion, that is not seen physically but understood, is transformative, and becomes a compelling work of art, opening many doors to thought and feeling. Chauncey Secrist’s two untitled pieces work with an equally subdued palette. They are much alike in their fundamental aspects. Each allows a freedom of interplay as cognition supports emotion and vice versa. 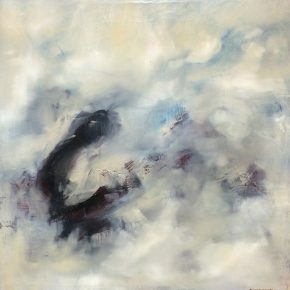 In these works there is an expression that is soft and billowy but at the same time intense. Most of the surface of both paintings is somewhere between white and a pearly light gray, highlighted with gestures of azure blue which stir the pieces. In each, there is a mass of charcoal gray, which seems to cause disruption in the billowy white and is a force for the source of the viewer’s experience. The pieces would certainly be interpreted as emotive as the bulbous black amorphous form ascending from beneath gives what would be a mass of tonality, of substance, a true dimension of palpable experience for the viewer to feel, to perceive, to sense, to absorb. The emotive force of the paintings requires an impression of some aggression, this dark amorphous form that perpetuates and gives structure to the inertia of the swell of emotion itself. This more tangible, darker form, and the ethereal tempest give each a clearer sense of subject, together. Jo Conteh’s “Wetlands,” exudes a similar ethereality. Instead of a brush, Conteh uses written notes on shards of paper with other strips of paper to construct a complex yet spirited piece with a wildlife subject. Her collage elements are rousing in the uplift of the fragments that lose their identity as pieces of paper become form that gives life to the swelling of compositional emotion. 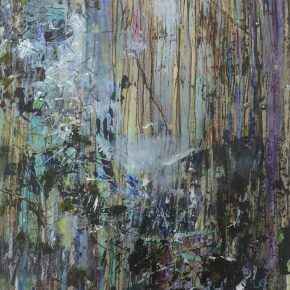 In a second composition, “Cliff Face,” she uses the same layering technique to create the density of forest, dark and encompassing, while some shards burst with light, to grab the viewer with an energetic, abstract and emotionally engulfing light. Rod Heiss is represented here by multiple pieces, which show the artist’s command and range of abstract techniques. Working with layers of gesso and colors that stain and saturate, Heiss creates large abstract works with a cosmic expansiveness. “We’re Walking, We’re Walking, We’re Stopping” is an expression of emotion in a subtle and nuanced manifestation, that aims for a visceral and emotive experience, with a burst of light at the center of lucid color creating an emotional awareness. “Three Strikes You’re In” has equally powerful color, but with much more dynamic contrasts, the fiery bulbs of orange, yellow and red contained by a network of deep indigo. His use of paint and gesso to create these effects is a mystery . . . and masterful . . . and allows the colors to reverberate with fullest intensity to create an emotional receptivity without limit. A painting can show you something that resonates emotionally, like one man holding another who has slit his own wrists. This is a conceptual understanding of the emotion. But as this exhibition at Slusser Gallery shows, a painting can also resonate emotionally itself, as the abstract works in this exhibit demonstrate, having a direct interaction with the viewer. 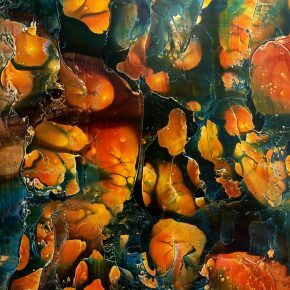 Emotion and Abstraction is at Slusser Gallery in Salt Lake City through November 13.